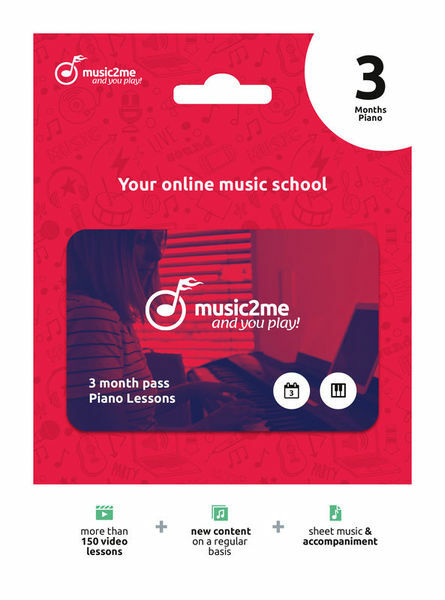 Both as a complete newcomer and as an advanced learner, with our piano lessons you will gradually learn to play the instrument. A well-thought-out and educationally well-structured course that facilitates visually staged videos with lots of additional information that makes practicing easier and accelerates learning progress. With the intelligent video player learning can also be individualized. If the track is too fast for you, change the tempo via the slow-motion function - no matter if faster or slower, picture and sound will always be in sync. Any sections can be marked and played in continuous loop. Own exercises can be saved and retrieved permanently. If you have any questions, our friendly piano teachers are always available. Different styles like pop, classical, movie music, gospel, blues, etc. Intelligent video player with practice function, slow motion etc. Web interface compatible with PC, Mac, iPad, Tablet, iPhone, Android etc. ID: 440538 © 1996–2019 Thomann GmbH Thomann loves you, because you rock!